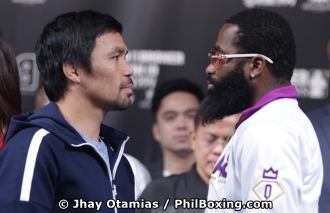 WBA welterweight champion Manny Pacquiao is all set to test his punching power, stamina and overall strength for the first time as a 40-year-old fighter when he squares off with former four-division world titlist Adrien Broner Saturday night in Las Vegas, Nevada. Pacquiao’s first fight after turning forty last December 17, will determine his staying power in boxing as he sets his sight on three to five more fights before embarking on a higher elective post before the 2022 national election in the Philippines where he is serving a six-year term as senator. The lone eight-division world champion is coming off a knockout win over Lucas Matthysse of Argentina in 2018, Pacquiao’s first after his last KO win against Miguel Cotto in 2009. A win over Broner on Saturday night would reinforce Pacquiao’s claim that at 39, he feels like a 27-year-old fighter. In a post-fight press conference following his victory over Matthysse at the Axiata Arena in Kuala Lumpur last July, Pacquiao admitted that while on training for the fight, he had noticed signs of slowing down. “I’m still okay, I’m still fine. I’ve worked hard for this day, and you guys saw it when I was training and preparing for this fight. “I feel like I’m 27 years old. Even when my teammates wanted me to stop training, I still continued to push myself to the limit. You can say I’m 27 or 28 do I look 39 years old?” he asked. Pacquiao recalled his training when he was younger in his 20s as he talked about dedication to the craft as a way to become a world champion. “I was training the way I was in my 20s, the coaches guided and controlled me, which gave me more desire to push myself. At the Wild Card Gym in Los Angeles, longtime head trainer Freddie Roach, who was summoned by Pacquiao to rejoin the team after being sidestepped during the training for the Matthysse fight, said Pacquiao’s killer instinct is back. “The killer instinct is back,” Roach said right after the sparring session with Pacquiao spar mate Arnold Gonzales. Pacquiao’s killer instinct may have resurfaced after his KO win against Matthysse which could trigger a series of knockout wins in his succeeding fights. The 29-year-old Cincinnati native is reported to have encountered a number of training distractions, mostly caused by court appearances and summons arising from his pending court cases that require his personal attendance. Seemingly Broner is ill-prepared for his tough fight against the world’s eight-division champ, who has prepared well for the weekend fight. Broner is a tough opponent having been a world champ many times over. But Pacquiao has the skill and experience that Broner lacks and Pacquiao could indeed score a KO win in the early rounds.